We Mean Business > d i v e r s i t y w o m a n . c o m W i n t e r 2 0 1 9 D I V E R S I T Y W O M A N 25 recruited by Spencer Stuart for her first board position, at consumer research company Arbitron, since acquired by Nielsen. Marilyn Nagel, former chief diversity officer at Cisco and founder of Ready- Aim-Aspire, which helps women attain leadership positions, speaks to groups on "board access." She recommends starting this work early, as Archambeau did—at least two years before you hope to serve. 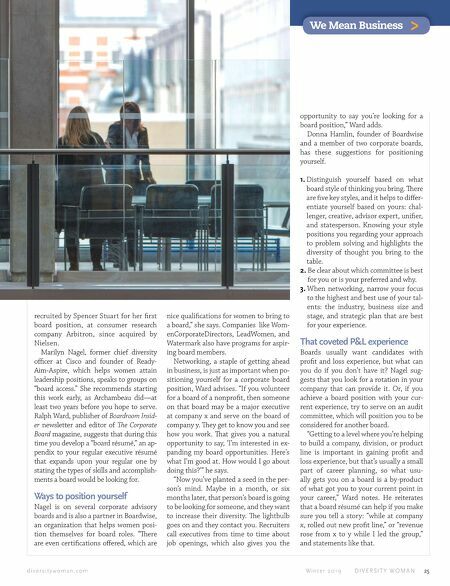 Ralph Ward, publisher of Boardroom Insid- er newsletter and editor of e Corporate Board magazine, suggests that during this time you develop a "board résumé," an ap- pendix to your regular executive résumé that expands upon your regular one by stating the types of skills and accomplish- ments a board would be looking for. Ways to position yourself Nagel is on several corporate advisory boards and is also a partner in Boardwise, an organization that helps women posi- tion themselves for board roles. "ere are even certifications offered, which are nice qualifications for women to bring to a board," she says. 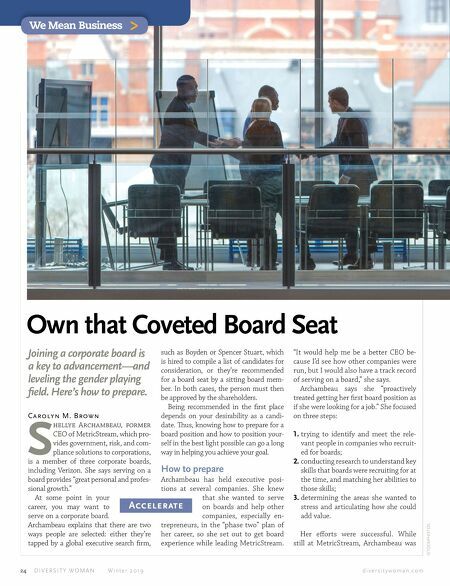 Companies like Wom- enCorporateDirectors, LeadWomen, and Watermark also have programs for aspir- ing board members. Networking, a staple of getting ahead in business, is just as important when po- sitioning yourself for a corporate board position, Ward advises. "If you volunteer for a board of a nonprofit, then someone on that board may be a major executive at company x and serve on the board of company y. ey get to know you and see how you work. at gives you a natural opportunity to say, 'I'm interested in ex- panding my board opportunities. Here's what I'm good at. How would I go about doing this?'" he says. "Now you've planted a seed in the per- son's mind. Maybe in a month, or six months later, that person's board is going to be looking for someone, and they want to increase their diversity. e lightbulb goes on and they contact you. Recruiters call executives from time to time about job openings, which also gives you the opportunity to say you're looking for a board position," Ward adds. Donna Hamlin, founder of Boardwise and a member of two corporate boards, has these suggestions for positioning yourself. 1. Distinguish yourself based on what board style of thinking you bring. ere are five key styles, and it helps to differ- entiate yourself based on yours: chal- lenger, creative, advisor expert, unifier, and statesperson. Knowing your style positions you regarding your approach to problem solving and highlights the diversity of thought you bring to the table. 2. Be clear about which committee is best for you or is your preferred and why. 3. When networking, narrow your focus to the highest and best use of your tal- ents: the industry, business size and stage, and strategic plan that are best for your experience. That coveted P&L experience Boards usually want candidates with profit and loss experience, but what can you do if you don't have it? Nagel sug- gests that you look for a rotation in your company that can provide it. Or, if you achieve a board position with your cur- rent experience, try to serve on an audit committee, which will position you to be considered for another board. "Getting to a level where you're helping to build a company, division, or product line is important in gaining profit and loss experience, but that's usually a small part of career planning, so what usu- ally gets you on a board is a by-product of what got you to your current point in your career," Ward notes. He reiterates that a board résumé can help if you make sure you tell a story: "while at company x, rolled out new profit line," or "revenue rose from x to y while I led the group," and statements like that.